Good Show Sir’s Art Direction: So I was drunk in this art gallery and this old wise man turns to me and says, “You know… the frame is probably worth more than the picture!” I was just like, “DUDE, you’ve just blown my mind.” Frames are expensive… we’ll make a fake one… I have an epic border to include. It’ll really round things off… I swear! One of these three things is NOT a real were-bear. Let’s learn how we can find out. Yon werebears should perhaps cut back on the cigarettes and coffee and consider using a whitener. Or at least do the closed mouth smile thing for these group shots. Arms are hard to draw. Wrap her all up in gauze and throw in a pair of fuzzy bears to distract the buyer. Gozer the Traveler called – he wants Vinz and Zuul back from their photo shoot. Why are the wear-bears’ mouths so orange? They look like they’ve been gorging on Monster Munch. The were-bear to the viewer’s left either has a tail that stretches for miles around the mountain and toward the moon, or else has just been visited by an alien suppository spaceship. This latter option might account for the somewhat bemused look on his face. This girl is one sheet to the wind. She probably should have gotten a taxi after that last pub. 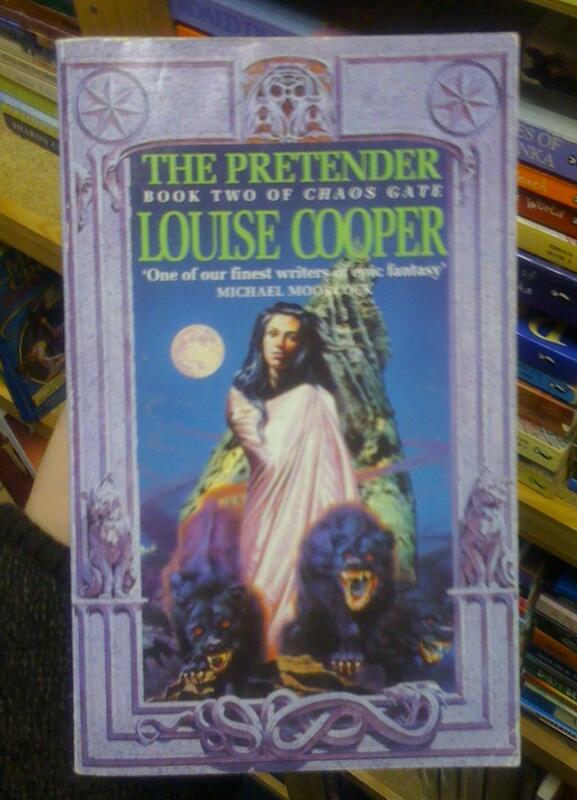 Hey, is this the same chick from A Vision of Beasts? I see them as ‘before’ and ‘after’ covers. Tom Noir @ 9, I think it must be. Her Earth has more than one moon, too. One behind her, one to her right and illuminating the side of her face, and one in front of her and illuminating her wrap. So either we’ve acquired three moons and five suns, or something in the air of future Earth is bending light rays in weird ways, day and night. And that is NOT Chrissy Hynde. This girl has none of the sultry streetwise vibe. She’s more like ‘The Poseur’. Red-eye has long been a problem in flash photography, but I’ve never known it as an issue with paitings. Until now. Ladies! Offset that kaftan with two ickle wickle bear cubs! You know, that frame only serves to make the seven-word title text, author’s name, and Moorcock blurb look crowded. And the animals on the frame only lessen the impact of the animals in the painting. But I suppose the design helps Cooper fans to find all three similarly framed Chaos Gate books on store shelves – because finding things by alphabetical arrangement is just too hard. @Tom Hering: Now you’ve gone and got me looking at all those word thingys. What a mess. Is Loiuse Cooper the Pretender? If so, is she pretnding to be Michael Moorcock? If that is the case, has she seen the covers to HIS books? You might want to pretend to be someone who isn’t chronically burdened with psychotic art directors ma’am. Now there is a thread on the late Louise Cooper’s website where she discusses cover art with some of her readers. Rather similar to some of the conversations with authors in these here comments: sometimes the artwork is an excellent portrayal of the book’s characters and setting (no mean feat in sci-fi and fantasy circles), but at other times causes the author to wonder where on earth it came from. The frame looks like something they would plant in one of the units on Storage Wars.